The first thing I did when I found out I was going to Argentina last year was pick my number one. I knew that my focus there was going to be studying, since it was a study abroad program, and I didn’t have a lot of money, but I wanted that one place that I HAD to see. The one that seemed to call to me in my sleep. That one place was Igauzu park. Iguazu park, or Iguazu as most people call it, is one of the most beautiful places I have ever seen. It has been a protected world heritage site since the early 1900’s and I was so excited to go from Cordoba, in central Argentina all the way up to Puerto Iguazu, Misiones in the northeastern corner. The entire trip would be an adventure. I had a 23 bus ride, followed by adventures in a city and country by myself where the native tongue wasn’t my native tongue. I know what most people think. 26 hours on a bus? No way, count me out! But, I would warn people to be open to the cross country bus system in Argentina. For one thing, the buses are fairly cheap and they serve you food with movies, there are also multiple options for companies. I went with Ultrabus and had a really good experience. There are multiple options for seating, and I definatly went with cama, which is the equivelent of our US first class. I could stretch out, there was water just behind me, and curling up in my reclining seat with the foot rest only put me a few inches shorter than a real bed. The other wonderful aspect is that they feed you! I think I had four meals each way, it wasn’t and extra cost, and it was edible, real food. That isn’t to say that you shouldn’t bring your own food to snack on. On my way back I got on the bus at noon and dinner was served at 10:30pm. Once I finished the challenge of the bus, speaking to people as naturally as I could with my mind double translating, I made it to Iguazu Falls Hostel. I have to say, I love hostels. I’ve had great experiences with all of them. This one had an outside patio area and a nice kitchen. I bought food to cook in said kitchen because I knew I was on a budget. Now the meat of the trip. 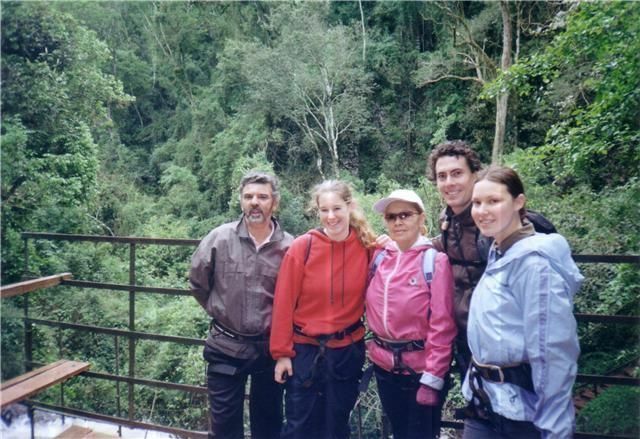 The three big things I did were 1. go to the park, 2. go to tres fronteras, and 3. go on an ecological adventure with Iguazu Forest. The first thing I did was the ecological tour. We went repeling, hiking, and zip lining in the green zone. This is an area that is getting slightly more protection, but not as heavily as the actual park. It was interesting to see the contrast of the poorest of poor and their iron red land to the inside of the jungle. The course that we followed led us by natural animal tracks, flying by birds heads, and watching monkeys play. It was fun physically, and mentally, as I had to translate from spanish to english for our portuguese tour guide. It was nice to see the way in which the tour was set up to save the environment, but keep people interested and supporting it. Next I walked down to tres fronteras. This places isn’t that big, but I thought it was cool. You can stand in Argentina, and just across the river are Paraguay and Brazil. It made me feel so small, but so traveled as well. Like I was seeing part of the world no one else in my life had seen. Other than that, this is a great place to buy some natural gifts. The prices are cheaper and all of the native people are nice, and could really use the money. Finally it was to the park. The one thing I did with a group was go on a drive in a jeep and then on a boat up to the falls. The company Iguazu Jungle does this and they do a great job, just be prepared to get wet! Wandering the trails and taking a boat ride up to the falls was amazing, but more than that it was reflective. I found myself realizing some truths about myself and my traveling abilities. It made me see deeper inside myself, understand others, and apprecaite more. The park is large, but do-able in a day. I honestly suggest two and to take your time, but one is enough. I don’t know how to describe such a beautiful place, you would have ot see it. Before I boarded the bus after just two days off of it, I was blessed enough to reflect on the many people I had met. Puerto Iguazu and the park itself are very popular destinations for tourists, but mostly from Israel and South America. I was blessed to talk with many of these people and share both culture and ideas. It gives me hope to see so many bright, hopeful, and ready youth like myself. The trip wasn’t too expensive and it was a lifetime achievement, and always will be. I want to go back and share this wonderful place and adventure with so many more people in my life, and I just pray that i get to one day. I strongly suggest going. It will open your eyes to a different beauty and many different cultures. I don’t regret it for a moment.